What Comes Inside the Nintendo 2DS Box? The Nintendo 2DS is a specialized incarnation of the Nintendo 3DS. Athough its name may indicate otherwise, it doesn't play a separate library of games. Instead, it plays all the Nintendo 3DS games, including games bought at retail stores and games downloaded from the Nintendo 3DS eShop. However, it does so without offering the option for 3D visuals. There's no 3D slider at the side of the system, unlike the Nintendo 3DS or Nintendo 3DS XL. If you have problems with 3D projections or are concerned about the effects of 3D on you or your youngster's eyes, the 2DS might prove to be an excellent option for you. The Nintendo 2DS is also cheaper than the Nintendo 3DS or 3DS XL and boasts a tablet-style design instead of the traditional clamshell design of the 3DS. In addition to playing 3DS games, the 2DS is backwards compatible with the Nintendo DS library of almost 2,000 games. Nintendo 2DS handheld console: Obviously, you need the Nintendo 2DS console. If you live in North America, your color choices are red and black or blue and black. If you live in Europe, your options are blue and black or red and white. Stylus: The Nintendo 2DS comes with a large, thick stylus that's much like the default stylus of the Nintendo 3DS XL. The stylus works as a virtual pen to poke around on the lower screen of the 2DS, although the system's tablet-like layout makes it easy to use a finger, too. 4GB SDHC card: An SDHC card comes packed with the system. You'll find the card in the 2DS SD card slot. The card holds 4GB of data, including saved game data and games downloaded from the Nintendo 3DS eShop. Nintendo 3DS AC adapter: The Nintendo 2DS utilizes the 3DS AC adapter, which charges the device's lithium-ion battery when it's plugged in. Unlike the 3DS, the Nintendo 2DS does not come with a charging cradle. AR Cards: As with the Nintendo 3DS, AR Cards (augmented reality cards) use the Nintendo 2DS cameras to project fun images and simple games onto a flat surface in your home. No subscription to Nintendo Power magazine: Alas, the magazine is dead, so the decades-old tradition of hawking subscriptions with every new Nintendo system is dead, too. Nintendo also offers an optional carrying case for the Nintendo 2DS. This soft, zippered case isn't a bad idea for gamers who carry their portables in bags, knapsacks, and other environments that contain pens, keys, and other sharp objects that might scuff up those beautiful screens. The Nintendo Store is an excellent place to look for new, authentic accessories or replacement parts for your Nintendo 2DS. Unfortunately, the store doesn't sell everything you might want for your 2DS. For example, if you need a replacement AC adapter for your 2DS/3DS, you can buy one at the Nintendo Store. However, other accessories such as a car charger, are sold elsewhere. On Nintendo's website, under each item, you can see where you can buy them if not from Nintendo's own website. 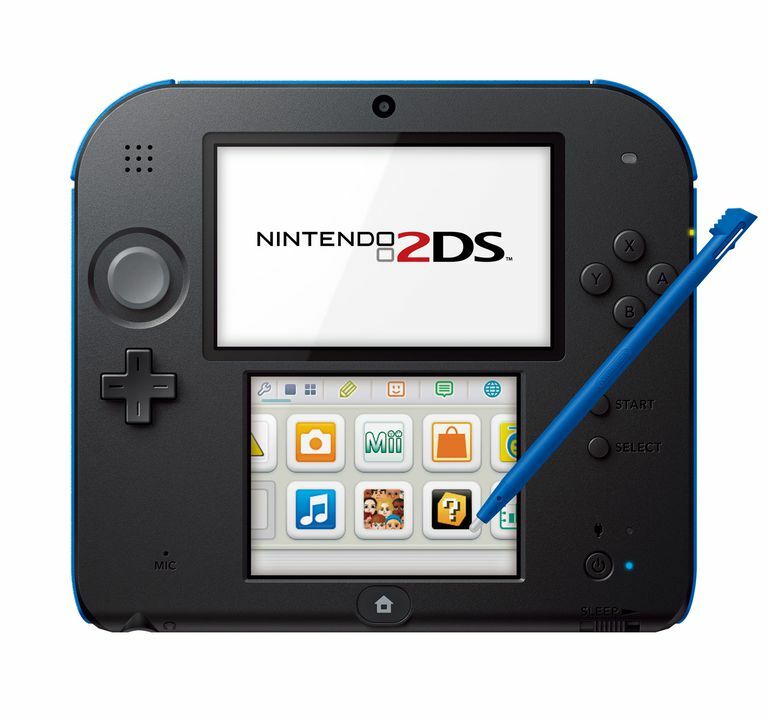 Amazon, Target, and Sears are a few places to look for 2DS accessories such as headsets and cases, but if you're looking for something used, eBay is your best option. Just remember that buying used parts might mean they're not in mint condition. Nintendo marketed its 2DS device as an entry-level handheld console for younger gamers after designating the 3DS as only for players age 7 and up due to health concerns related to the 3D effects.